Hey everyone! Today I'm back for week two of the Teachers Pay Teachers Seller Challenge! This is a fun way to motivate me this summer to work on my TPT Store! This week's challenge is all about blogging- sharing our dreams of what we want out of selling on TPT. That's what I'm here to write about today!! This week's challenge actually came at a great time! This spring I was in a Life Group where we were reading and discussing a book. One of the chapters was about our life goals, and making a life goal list. 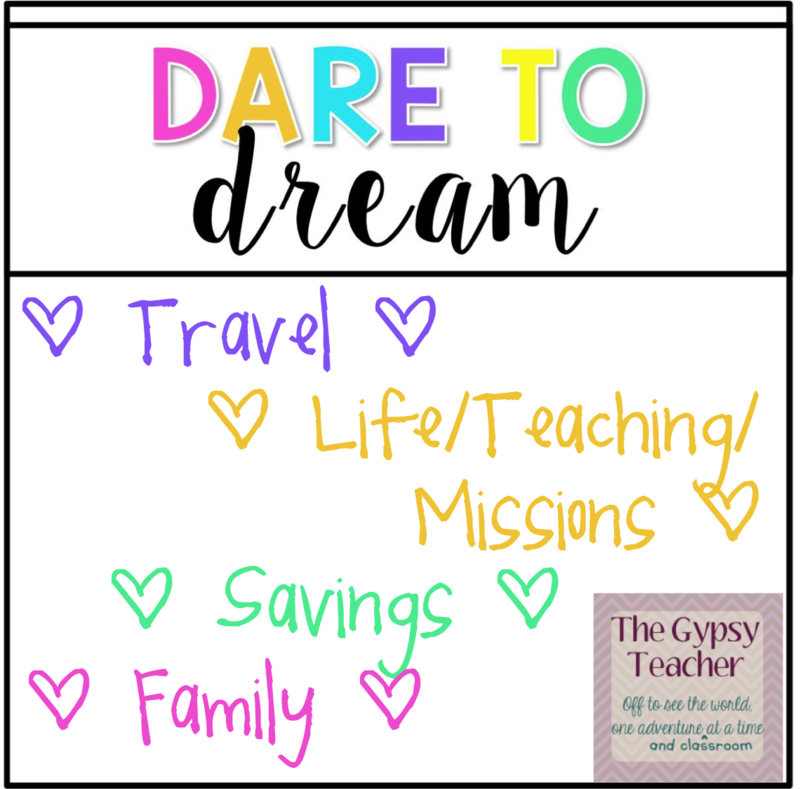 As I've been pondering what my dreams are for my TPT store, I've been thinking about what is on my life goal list too! Ever since about six years ago, when I went on my first missions trip to Bogota, Colombia, I had a dream to do missions and teach around the world. This kind of goes along with number one, but it's also separate enough, that I needed to mention both. Last summer, I got a chance to see if this "dream job" is actually what I'm supposed to do long-term. I received an email, actually a year ago TODAY, from one of my best friends, with a flyer asking for volunteer teachers to come teach in Moshi, Tanzania. After hesitantly applying, and a Skype call, I got the position! I packed, prepared, and headed off to a new place with a new job and a whole new culture, and have never looked back! This year has been a CRAZY AWESOME year of teaching, being a missionary, and feeling fulfilled in my "dream job"! I'm so excited to return for a second year at Hope International School with Global-Effect! With my volunteer position, they provide my necessities (airfare, visa, housing, and a small food stipend), but I need to raise my own support. I'd love for my TPT store to help with supporting my passion and lifestyle teaching as a missionary- as I would love to do this for the rest of my life! I'd love to put some of my TPT earnings in savings for the future! And, I'd also love to have some TPT earnings for a family in the future. I am currently single, but dream to someday be married and have children, as well as adopt! So what are your dreams? What would you like me to create in my Teachers Pay Teachers store next? You have beautiful dreams! I would love to go and teach overseas - what an amazing experience for you! Definitely! IT's such an awesome marketplace, that even when I'm in Tanzania (or wherever), I can still sell and make money to fund my dreams! I love it! YES! I used to travel and teach :) I finally moved back home to be closer to family, but I miss it. There are some not so well paid positions to teach conversational English in France. Do it!!! Chicken Stuffed with all things Delicious! TPT Seller Challenge: Makeover Madness!